The fact that the Gilet Jaunes protests were sparked by a fuel tax – an important part of Macron’s climate policy – has been downplayed by mainstream media analyses. A New York Times analysis of the largely rural dissatisfaction hardly mentioned the tax, and even analyses by Bloomberg go out of their way to wonder whether voters will turn to the hard right or the hard left come election time – a questionable supposition given protestors’ widespread rejection of electoral politics. To a certain extent, the importance of climate policy has also been de-emphasized by the “Yellow Vests” themselves, at least to the extent that protestors have claimed they will not remove the barricades even now that Macron has pulled the plug on the tax. Increasingly – and I have no reason to doubt its accuracy–the protests are seen as an assault on Europe’s liberal order itself – a referendum on technocratic, elitist and urban-focused policies for which Macron is seen as the natural heir now that Angela Merkel has said she will not seek re-election. In fact it seems like a pretty straight forward carbon pricing approach could have obviated Macron’s problems, but I’ll get to that in a minute. Contrast France’s political crisis with the bold rhetoric of Alexandria Ocasio-Cortez’s Green New Deal. The incoming Congresswoman is bidding to galvanize progressives by emphasizing a program of national economic and environmental justice. More than public speeches, she has published draft text for establishing a select committee in the House for this purpose before taking office and only a month after winning her election. Climate policy – in this case the failed climate policies of Republicans and centrist Democrats alike – is as much a flash point for political organizing as in France. The fact that both are being billed as revolutionary should hardly be lost on centrist parties that hold fast to a vision of global order in which economic liberalism and technocratic administration conspire in the progressive impoverishment of working people. Les Gilet Jaunes and Ocasio-Cortez are both highly aware that most people can’t afford climate change policies on offer today. There are lessons to be learned from the French debacle, but they can’t be limited to finding a softer glove for the fist of the state. A New York Times piece on this point argues “France’s cancellation of the tax increase this week in the aftermath of increasingly violent protests signaled the perils and political headwinds that governments worldwide may face as they try to wean their citizens from fossil fuels.” The infantilizing metaphor of weaning the populace from energy use is all too telling. Personally I doubt that cushioning the blow is going to do the trick. The imposition of consumption-based carbon pricing inevitably comes up against the hard fact that, by and large, many people have little choice over their use of fossil fuels. Moreover, this is a built-in feature of class relations. As a rule, as a matter of daily consumption choices, many people have direct say over energy use in two main respects: disposable income for discretionary purposes such as recreation or entertainment, and in decisions for larger purchases such as cars, home improvement, appliances, and so forth. Beyond that, for most working people the efficiency gains from marginal changes like adjusting the thermostat or limiting automobile use don’t seem worth the political cost. The only thing they do is make a difficult life less sufferable. The idea of using revenue for investing in infrastructure or energy projects that will take years – if ever – to help people out seems pretty obtuse. Are you really going to tell folks living in small towns to take the bus rather than drive? Don’t get me wrong, I’ve lived in small towns and rural bus routes are life-savers for many, many people. But people are pressed for time as much as cash, and the fact is these policies, even when they make sense in the long term, place the immediate burden on the wrong people. After all, a nominal fuel tax no doubt will have virtually no effect on the behavior of the wealthiest – I mean the largest – polluters. One could even surmise that a flat tax will never appreciably reduce emissions, for the simple reason that those who are income strapped have little choice and for most of those who are flush it makes little difference. The number of folks for whom 6 cents a gallon is the deciding factor must be fleetingly small. To think that a velvet glove approach will work belittles the intelligence of those expected to submit to the policy. A fee and dividend approach would have made a world of difference for Macron. If you want a populist measure for populist times, brand your carbon pricing well. No new taxes. Take from the big polluters to bolster the income of the working class. Price carbon, but return all the money to the people. On the eve of California’s Global Climate Action Summit earlier this year, number of prominent fiscal conservatives associated with the Climate Leadership Council released a major report that was virtually ignored. George Shultz, Larry Summers, Christine Todd Whitman – you can hear the progressives moaning – even Trent Lott have co-authored a white paper arguing for the fee and dividend model of carbon pricing. This form of pricing has been advanced by the likes of Exxon-Mobile, while similar proposals have been championed by Sentators Maria Cantwell and Lisa Murkowski. It has also long been a central prerogative of climate justice activists – think Naomi Klein – on the far left of the American political spectrum. No wonder these proposals keep getting ignored. A fee and dividend model puts a price on carbon emissions, but instead of collecting that money as tax revenue, it returns it outright to resident tax payers and dependents as an even payout. Those who pollute more, pay more. Those who pollute less get a nice check every month. Administratively it’s comparatively easy because everyone gets the same amount. Got four kids and take the bus everywhere? Nice. Add to that a rebate model that supports people who are structurally disadvantaged (think cost of living emissions like basic transportation, housing or heating), and buoy efficiency improvements for upgrades and major purchases so people will actually think it’s reasonable to replace their fuel oil boiler with natural gas or buy a smaller car. Furthermore, it’s important to price carbon emission upstream so that the policy doesn’t feel so stingy – or so personal. If you put a fuel price at the pump, it hurts me. If you tax it at the refining process then the costs are distributed through the economy, and it ceases to be a kind of moral judgment on people who need to drive. After all, corporate actors are in a far better position to come up with climate solutions than most people who are structurally in the position of accepting the limited array of options presented to them. Is it possible that Gilet Jaunes, Alexandria Ocasio-Cortez and Larry Summers could share something in common? There is only one way to find out. Paul Saint-Amour, an English professor at University of Pennsylvania, has written a provocative reflection on the resonances of war trauma, states of privilege, and ethical implications for global climate change. It’s a follow up to another recent piece from a specifically American vantage point, Roy Scranton’s Learning How to Die in the Anthropocene. Talk of the ethics of climate change from the perspective of the privileged global north has become a bit of a cottage industry in recent years, since when viewed in a certain light the very problem of climate change seems to provoke a ‘perfect storm’ for modern ethical philosophy (what with the problem of altruism and sacrifice/discounting for anonymous future generations). Malcolm Bull’s review of Stephen Gardiner’s book by that name, A Perfect Moral Storm, is a case in point. Still, I think this kind of sustained debate among those in a position to do something about global carbon emissions is extremely important. In my view, there is no possibility of resilience or adaptation that does not include a radical reduction in emissions, and to present these as alternatives to each other, as is sometimes done by pundits or economists like Euston Quah, is to offer a false choice that goes beyond optimism. 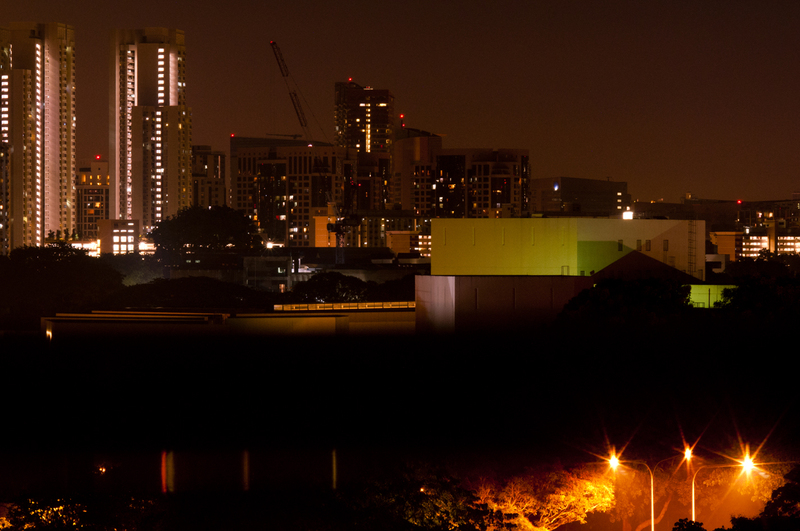 Privileged populations like those of the United States or Singapore have a global responsibility to take climate change disasters seriously – not as a matter of altruism or charity towards disadvantaged neighbors, but as an integral component of their own affluence. Saint-Amour takes a different tack from Bull and Gardiner by shifting focus to the complexities of trauma that accompany the devastating unravelling of social fabric under conditions of disaster. I’ve often thought that war and environmental disaster have interesting and important parallels: both are the outcome of much longer processes that produce situations that cannot be controlled; both (at least in contemporary times) are quintessentially environmental; both produce suffering not simply because they harm bodies or exacerbate inequalities, but especially because societies are fragile things intimately tied to space and ecology – and both war and environmental disasters make that fragility impossible to maintain. If trauma can be a consequence of war and disaster, it is because of this intimacy. Saint-Amour brings this connection home through the contemporary figure of the drone attack, which produces an environment of terror through the experience of constantly hearing drones overhead and knowing, fearing, that at any unknown moment terror from the air may strike someone dead – but whom, and on what impenetrable calculation? Moreover, his attention is drawn by the specific asymmetry of the global relation, in which American empire secures its state of privilege against the radical inequalities it orchestrates and preserves through perfectly asymmetrical warfare. While in the end I’m not sure the drone is an adequate figure for the ethics of climate change, it does a better job than the calculative rationalism proposed by Malcolm Bull. What’s up with the developing country pledges leading up to the Paris COP? I wound up in an interesting debate on the climate change anthropology email list today (<climate-change-anth@binhost.com>) with an anthropologist who’s been involved in the UNFCCC lead-up to Paris. I won’t publish what she wrote on a closed list here, but I figured I would put up my comments since I spent so much time on it when I should have been doing other things. Some might find this useful/relevant. Keep in mind that many pledges use a BAU baseline, which makes them very hard to interpret. For example, Singapore (not on this list) pledges a 11% reduction from BAU by 2020, but if you dig around in the national climate strategy you can figure out that they expect an overall 78% increase in emissions, so they’re really pledging a 67% increase and calling it a reduction. And the BAU will obviously change whenever they revise their assumptions. Anyway, the language they’re using now is a stellar demonstration of anthropocene/poeisis. ‘Intended Nationally Determined Contributions.’ What a great process! Bravo to the Obama administration to destroying the Bali accord/ LCA approach. agreement on a global treaty to start in 2021. Convention on Climate Change website. The response back, from someone whose work deserves careful attention, was straight forward enough: Jerome, you’re not even in the ball-park. So I took the trouble to explain my admittedly flippant commentary. I agree with your last thought, that the predicament is extremely difficult to find a way out of: climate change goes to core issues that cannot be solved by fiat. But I’m not sure I follow why you disagreed with my assessment. Do you think a 67% increase in emissions can legitimately be described as a reduction? I personally, and respectfully, think this kind of accounting trick is done in bad faith (although the Southeast Asian developing country negotiators I have met all have excellent intentions). Also, Pershing and Stern were very clear at Copenhagen that there was no way the US would enter an agreement that bound the US economy to UN-mandated quantitative reductions. It was not just about whether the BRICS would also have commitments – none of them either wanted anything so strict, and the acrimonious blaming just distracted from the fact that US engagement with the FCCC fundamentally transformed the nature of a future agreement. Now, in my view, they have built in specific ways to make the numbers obfuscatory (which, as we know, is routine business when it comes to environmental justice issues). I think it’s awesome that a host of developing countries are engaging in this exercise. But just as with carbon markets and the comprehensive fraud that accompanies claims of additionality [add link and link], if we are going to have a regime that regulates emissions (rather than extraction), the numbers had better be rock solid, and building in counterfactuals like BAU is precisely the wrong way to do it. Why do we need complicated derivatives-style accountancy that projects responsibility for climate change onto a (speculative) future? Isn’t this about histories of fossil energy extraction and systemic land-use change? As for a concrete program of action, I’m excited by Heede’s work that shows a substantial majority of historical emissions can be attributed to just 90 companies (link), by divestment activism and attempts to shift the focus from atmospheric emissions to fossil extraction in historical context (such as the work of Carbon Tracker, EcoEquity, 350.org). (I am sympathetic of criticisms of Heede like William Buckley’s, but ultimately I disagree with persistent attempts to place responsibility onto consumers. A particularly noxious example of this kind of deflection is the now-classic ‘billion high emitters‘ argument. The debates in the UN, after all, are about who gets to produce–not who gets to consume.) Like so many others I also am waiting for a robust UN commitment, and look forward to seeing what happens in Paris. That process deserves to be critiqued, for there is too much at stake to build in loopholes: having high expectations is not the same as being negative. If you want to see the differences the loopholes can make, look at the concessions made to Russia and the former Soviet bloc during Kyoto – the 13 billion (!) so-called hot air permits that came from setting the baseline as 1990 (peak production) instead of 1992 (during severe recession). One thing that would make a huge difference is if one country – just one country – made a costly, good faith demonstration of how serious the problem is. If a country like Singapore (where I live and work, and which I have tons of respect for) simply said ‘we know it’s a drop in the bucket but we’re going to regulate shipping and refining emissions, because no one is dealing with these issues and we actually have the ability to make a direct difference’ – just that would demonstrate unparalleled leadership. Instead we get self-congratulatory nonsense and a rush to further invest in petrochemicals. Ok, now I’ve wasted even more time procrastinating… but maybe this will be useful in some future or another. As part of a special issue of PoLAR I’m editing, here’s my contribution, Carbon as a Metric of the Human (pre-publication draft). Not sure when it will be out yet, hopefully soon. Abstract: In this paper, I frame the imaginative space of carbon management as a domain in which active reflection on the uncertain significance of climate change is able to take material form in the construction of new infrastructures of carbon accounting and carbon markets. ‘Carbon’ refers not to a chemical per se, but to a complex space of global atmospheric relations rendered material. I describe the historical ontology of carbon and atmosphere, which together form a distinct global medium. The atmosphere as medium is manifest in the informational spaces of digital platforms meant to work on the human subjects of climate change. I describe the carbon accounting practices of two Beijing-based enterprises that are involved in building out the infrastructure of carbon accounting for the purpose of decarbonizing Chinese industry. Carbon is at the center of a contemporary formation that is imaginative, materialist, heavily quantified, and oriented toward the technical modification of human affairs. It supposes that humans as planetary agents have become significant in terms of collective activity that is historically recent, highly unequal, and global in scope. The human is configured not as a biological species, such as in debates about life itself or distinctions between humans and other species, or in terms of an essential humanity that can provide the transcendent bonds of a moral community. Rather, carbon formulates the human ecologically and geologically, and with an eye toward imagining the future forms these relations might take. Hence, climate change has posed the human as a contemporary problem with particular urgency. One does not need to go far in the public discourse surrounding climate change to be inundated with the mystique of number. In the United States, where viewers of Al Gore’s An Inconvenient Truth were treated to specific stunts of quantificatory pontification, just as in Singapore, where I teach climate change to nonspecialist undergraduates, the numberwork of graphs and charts has its own techie vitality. Check out the graphical puppetry in this University of Minnesota project in which a cellist tracks global temperature changes no matter how out of key the song is. The human is the dependent variable of an unknown function, whose independent variable is temperature driven by anthropogenic CO2. Anthropogenic goes two ways: anthropogenic CO2 has re-made the climate, and now the climate promises to dictate. Where is this tune going? Drawing on my on-going research on the imaginative dimensions of carbon accounting, in this commentary I look toward key moments in the emergence of climate change science to identify why the numbers mystique holds such powerful sway over the possibilities for thinking climate change. Part of the story must include the promises of ‘big data’ and sheer computational prowess of the late-20th century. But what fascinates me are very early moments in climate science that seem to have secured the terms through which contemporary political thought takes place. Joseph Fourier, working in the first decade of the 19th century, secured the mathematical speculation at the heart of climate modeling and associated debates about uncertainty. Svante Arrhenius, often credited with articulating the first complete theory of climate change, published in 1896, decisively established the quantification of carbon dioxide as the key independent variable, and articulated this in the same form through which carbon quantification is dealt with today. Lastly, Dave Keeling’s monumental efforts to rigorously measure global CO2 levels have established the unity of climate change as a scientific and political issue based on its theoretical human etiology. When one imagines scary apocalyptic futures fraught with uncertainty but which hinge on that single variable, through these three elements—speculation, quantification and anthropogenesis—that imagination is possible. Climate change is a sui generis political challenge. The atmospheric and geochemical processes at stake continue to outpace our still-emerging understanding of Earth as planet and home. While actual weather events outstrip our capacity to understand them, the informational basis for experiencing climate change has led to a situation in which a single variable, atmospheric concentration of GHGs, measured in parts per million, gets prioritized as the focus of global attention. Paul Edwards (2010) describes the extensive global knowledge infrastructure of climate science as a prerequisite to ‘thinking globally,’ the coming-into-being of a planetary ecological experience slowly emergent over the twentieth century but rapidly intensifying. It means that the experience of climate change is always an experience of information within an elaborate infrastructural ecology. As Edwards describes, climate science has articulated an extremely powerful, integrated global knowledge infrastructure. But in political and economic domains, the analogous market infrastructure has increasingly fragmented regulatory space across what Jane Guyer calls platform economies, which aren’t markets per se but informational platforms through which practices of innovation, fraud, political influence, investment, gaming, entrepreneurship and other kind of climate-related market activity proliferate. Several categories of practical reason can be delineated here, namely planning, design and management. I work with these in turn to lay emphasis on a fourth category, remediation. The anthropological significance of an international climate regime is that it represents an emergent attempt to manage the chemical composition of the atmosphere. To that extent, let me express a sense of amazement at the scope of ambition in the project to establish a singular global climate regime, which so far has remained elusive. Another way of looking at this is that carbon information—carbon accounting and carbon markets—seeks to remediate humans’ material involvement in the geological carbon cycle. Paul Rabinow (2007) uses the term remediation to describe processes subjected to new media strategies within programs of improvement. Quantification of atmospheric greenhouse gas emissions forms the centerpiece of all major regulatory strategies for minimizing climate change. Turning ‘carbon’ into detailed information about human activities, which can then be financialized in various ways, seeks to remediate humans’ role in the geological carbon cycle. In this talk I want to focus on the priority given to atmospheric greenhouse gases as the sin qua non of economic planning for minimizing global warming. I describe how the anticipatory or speculative inheritance of climate knowledge overshadows and, in practice, has reproduced practices of speculation within highly mediated market contexts. Carbon as information emerges in carbon accounting and trading practices, both of which form the primary basis for economic planning for minimizing global warming. One result of the emphasis on a single variable is that carbon has become an intriguing and wide-spread metric of the human capable, in different ways, of bearing on human–atmosphere relations. This has invited widespread creative activity that critically reflects on the potentiality and mutability of carbon in diverse forms. In part the question is simply, what experimental projects can be done with carbon? What forms does carbon take and what informational platforms can it circulate on globally? In Thailand, since 2007 or so many industrial agricultural firms have invested in emissions reduction projects in the hope of selling their reductions to European buyers through a United Nations process called the Clean Development Mechanism. I’ve been interviewing these agro-businesses and the companies that help them set up the carbon projects. These projects produce methane from wastewater from their processing plants, then carefully measure the methane and burn it for energy. The unprocessed wastewater is jet black, with a sharp, highly organic smell. Water pollution is measured in terms of chemical oxygen demand (COD), which indicates the load of organic compounds. It is processed in large, tarp-covered digester ponds through an anaerobic process. The main gases that come out of the digester are CH4, HS4, H2O and CO2. HS4 is highly corrosive and presents a major business challenge because it destroys instrumentation. The measuring requirements, mandated by the UN, are highly complex and most companies fail to ever earn any credits to sell, although they often continue to capture methane and burn it in the factories. The crucial component is this informational process of converting chemistry to information, and those companies which are successful have had to come up with innovative business models. There is a monetary component here, driven by an entrepreneurial relation to risk, but the crucial management dimension is conversion of chemistry to information. I mean management here as a category of practical activity that bears on complex relational materialities. The Thai agricultural carbon producers have to figure out how to manage a chemical-informational exchange between corrosive waste gases, international carbon finance and United Nations regulatory proceduralism. As part of a much longer argument I have developed elsewhere, management comes to bear on problems that can’t be solved in any straightforward way. What gets managed? Large companies and employees, to be sure, but also floods and forests, ‘environments,’ pain, mental illness, traffic, sewage, risk, information, intractable illnesses like diabetes, public relations, disasters, crises, activists and shareholders alike. These are objects of management. Each points toward on-going material-semiotic negotiations with not-natural, not-cultural entities like, in this case, our new atmosphere. Problems for management are delegated to managers, investors and entrepreneurs. Management is a labor relation internal to capitalist enterprise but always heterogeneous to it, for it deals with knotty materialities that may never be abstracted enough to cleanly enter relations of exchange. Viewed differently, management represents a zone where government, commercial and technical practices are maximally indistinct. Here, carbon quantification constitutes the atmosphere as an object of management via chemical-informational interfaces. Market-oriented policy relies on speculative competition to drive a carbon price. Since 2010, carbon prices have collapsed, and continue to be very uncertain.Europe’s market was set up in 2005. Donald MacKenzie (2008) has described how the design of Europe’s emissions cap had a fundamental flaw, namely that it allowed governments to promise lobbyists free permits, even if those promises added up to more than should be allowed in the total system. A related problem is that most of the permits through 2012 have been distributed free (beginning in 2013 they will increasingly be auctioned). So while industries enjoyed windfall profits—essentially a multi-billion dollar subsidy for agreeing to accept climate legislation—the overall cap on emissions has turned out to be far too weak. Estimates now suggest as many as 1.5 billion excess permits are in the system, exacerbated by UN offset credits like those produced in Thailand. The proliferation of separate carbon markets in China, Thailand, Australia, California, South Korea and elsewhere helps demonstrate the technical complexities of these platform economies, each of which defines a virtual space complexly articulated with others. The market fiction here is that a ton of carbon is always equivalent to a ton of carbon, no matter where on earth it is emitted—but this view says nothing about the entrepreneurial practices at stake. If planning is going to rely on the enterprise of commercial actors to create new technologies driven by a price on carbon, they will have to take into consideration these other kinds of enterprising activities such as lobbying, fraud and theft, which actively reconceive the material dimensions of information across diverse platforms. Guyer has suggested that diverse platforms of creating and exchanging value offer a kind of segmented landscape as an alternative to so called market economics. The knowledge here is knowledge of these socio-technical devices. I view platforms literally as the informational and normative-legal bases for establishing exchange, and make the point that diverse platforms proliferate radically, while movement between platforms is the high-risk, high-reward activity par excellence. Donald MacKenzie argues—and I agree to a point—that there is tremendous capacity for technical criticism by critical scholars, but I don’t think design criticism alone can account for the ways governmental prerogative is continually held hostage to the demands of lobbyists and industry. The lesson is that it’s politically relatively easy to set up the informational platforms for carbon regulation, but setting the cap on emissions—the limit to pollution—is extremely difficult. Planning for climate change means distributing obligations to reduce emissions while minimizing the economic costs and uncertainties of doing so. The assumption is that policy clarity and fairness gives industry the opportunity to make good investments in the long run, and that energy infrastructures take a long time to re-tool. But the term ‘planning’ may be something of a misnomer in such explicitly market-oriented contexts. I take planning as the application of norms to detailed decisions about how people live, within a commitment to systematic knowledge about the social. Yet by regulating quantified emissions in the abstract, quantification defers all the major detailed decisions about how companies and people respond to carbon constraint. Carbon information promises to let people or companies make their own decisions about how—and how much—to reduce emissions based on a price signal. It promises normalization via measurement and trade, without any commitment to specific norms or detailed social knowledge. Carbon markets have been seriously chaotic for the past three years due to the design failures just mentioned, but part of the problem is that Europe has achieved its goals too easily due to the economic recession. The cap on emissions was set in 2004 or 2005 based on modeling of the economy that simply proved wrong with the financial collapse. For industries regulated by the carbon market, a low price is great—it means lower costs and less obligation to do anything. What interests me from a planning perspective, however, is that debates about the price of carbon in Europe have hinged on what the purpose of the market is supposed to be. Well, the point of the market is to lower carbon emissions, right? Yes, but what does that mean? Many people in the EC felt that the objective of the carbon market was to transform Europe’s technological base for power generation, and that the carbon cap was an imperfect tool for doing so. Many companies agreed, too, since the carbon price was an effective subsidy for all sorts of new technologies. Others said the EC has confused its policy directives, and had undermined the carbon price by subsidizing wind and solar power through a different renewable energy policy. In other words, is the issue just a linear numerical reduction in CO2 emissions? These actors suggest a more thorough critique in the form of a project to transform the energy basis of society. It suggests the contemporary atmosphere is an artifact of a historical form of industrial economy in which the practice of burning fossil fuels makes people geological actors. In the meantime, the coherence of carbon markets as a planning strategy, once held in place by the legally binding orientation of United Nations negotiations, has been thoroughly undermined. Since its inception, the UN approach to climate change was eventually to set a legally binding numerical cap on total emissions among those countries which have obligations. As one Sierra Club campaigner told me, global climate policy “depends on a concrete definition of the universe within which emissions occur, and carbon trades cannot involve reductions outside of that universe.” That principle was the organizing logic of a planned UN climate administration. What’s happened since 2009, however, is that multiple universes have proliferated. At the UN conference in Copenhagen in 2009, all of this was called into question, and it can no longer be assumed that negotiations will result in a single, legally binding agreement with an overarching numerical commitment to lower emissions. Instead, we face a far less unified, heterogeneous international policy space and we won’t know if a reasonable plan will emerge, in my view, until 2017 at the earliest. To answer the question posed by this panel, in fact nobody has a plan. Concerning planning, what’s most interesting to me as an anthropologist is its problematization (Rabinow 2003, following Foucault 1988). A problematization, [writes Foucault] … does not mean the representation of a pre-existing object nor the creation through discourse of an object that did not exist. It is the ensemble of discursive and nondiscursive practices that make something enter into the play of true/false and constitute it as an object of thought. Two problematizations emerge here I want to affirm. First, is climate change simply a problem of the numerical concentration of greenhouse gases, or is it a problem of a historical form of industrial economy in which social organization is predicated on planetary-scale geological practices? Second, given this planetary scale of human intervention and its intimate connection to how people live in the contemporary, what is the form of international governance suitable to climate intervention? These problematizations, I believe, define the actuality of climate planning today. Governmental processes are highly reliant on market actors, due to several decades through which governments have deferred many if not most major decisions to commercial interests. Frankly, governments don’t know what to do about most of their problems, and they have less and less capacity to act even when they can figure out what to do. At the same time, the attitude through which commercial and nongovernmental actors approach climate change can often be very surprising, and I find it best to view climate change as an anticipatory, highly imaginative space of practical elaboration of different potential futures. These imaginative processes bear on polluting behavior and on innovative human-atmosphere relationships to create new platforms of exchange that may or may not articulate with each other. Carbon information makes this possible, especially through the emergence of atmosphere as an abstract space of quantified global and future relation. By tracing management, design and planning as categories of practical reason appropriate to climate interventions, I’ve traced a story about the actuality of climate planning with respect to two problematizations: will carbon markets and other platform economies serve to transform the fossil energy basis of late industrial economies? And, given the planetary, atmospheric and geological dimensions of climate change, what is the form of international governance suitable for climate intervention? To this end, let me conclude with thoughts about a fourth category of practical reason, remediation. Carbon accounting practices objectify the atmosphere and, in so doing, posit the atmosphere as a new medium for global relations. Atmosphere is a literal medium, in the sense that it envelops the earth and increasingly forms the possibility for new anthropological futures. Atmosphere is also a medium in the sense that its physical characteristics form the basis for work, that is, a way to slow the transition rather than simply arriving at climate change ‘immediately,’ as it were. Work implies a pragmatics of imagining different futures, combining practices of logical extrapolation, speculation, and materialization. Carbon accounting remediates human involvement in geological carbon cycles. The link between database and identity, and database and carbon (the express valuation of carbon as identity) in the case of carbon registries deserves reflection. I re-post here comments I made there. The Uidai database(s) parallels many aspects of carbon registries which are proliferating all over the place – these semi-autonomous data/reporting platforms through which companies report emissions and track their efforts to reduce quantified emissions. They’re also the basis of regulatory carbon markets. In interviews in Beijing I was struck that, in addition to several governmental efforts, several companies and NGOs were setting up carbon registries of various sorts and attempting to enrol polluters into voluntary submission of carbon emissions information. De-duplication is not the problem of these platform economies (Jane Guyer’s term), so perhaps the iteration I pose here repeats the Hegalian tension Lawrence marks between India and China at the outset. (Having no real area expertise in either, it’s difficult for me to say.) But if not de-duplication, then what? As when Lawrence mentions Stephen Collier and James Ferguson’s respective reflection on potential forms of the neoliberal social, I recall a chapter from Marilyn Strathern’s After Nature, ‘The Greenhouse Effect.’ There she theorizes the plasticity of class formations through a strong participatory dimension on the one hand (her example is the proliferation of families who sell access to domestic space through the bed and breakfast) and the conversion of ‘relation’ conceived generically as ‘resource’ – so, for example, the idea that one’s family connections can be treated as a resource in the quest for upward mobility. The plasti-class is that which actively and intentionally participates in the game of maximizing resourcefulness; it is not bourgeois necessarily, just ambitious. Does ‘not necessarily monetary’ define a specific object? It would be wrong to say these are nonmonetary. Rather, the relation is different. It matters if the registries are monetary due to local design considerations, but there are many contexts in which it’s not necessary. Actually I hesitated before writing ‘thoroughly capitalist’ just now, because the obvious point is that Chinese capitalism is precisely what is being problematized through these informational platforms. Recuperating that problematization would, I think, transform what I’ve just written. Carbon regulation is conceived here not as a necessary curative for climate change, but as an instrument for restructuring the economy through capital investment in less energy-intensive industries. Reciprocally, the discourse around China’s ‘low carbon life’ points to active reflection on work & consumption, in effect constantly raising the question of how to maintain happiness with respect to one’s work, how to consume in a reflective manner. To that extent, economic restructuring and the low carbon life both pose a degree of distance from growth per se and ask, in effect, how to grow appropriately. So then once again carbon reflects on not-necessarily-monetary value, or at least the possibility of holding that open as an option. One point to push further is the association of carbon and identity. A significant complaint raised by companies is that carbon information is very sensitive – competitors might use it to understand a polluter’s production process, for example. Part of the way information is presumed to work especially in the context of data mining is that pattern itself reveals identity; for example I’ve written elsewhere about climate change fingerprints in the context of assessing whether ecological transformations bear causal relation to global warming. Likewise, the fetishization of information I describe in Accounting for Atmosphere toward the end of the paper suggests how ownership of information about carbon can be established as a highly aggressive act (the hackers’ term is ‘owning’). One last reference point: a major problem – even the major problem of the complex carbon accounting methodologies applied through these registries is the problem of carbon’s identity, that is, whose liability/opportunity inheres in the quantified relation. All of this deserves more thought, but one initial observation is that the problem in the attribution of carbon is carbon’s identity, not that of the polluting entity, for a novel resource asset (‘carbon’) whose primary attribute is its planetary fungibility through which a ton of carbon everywhere is always presumed equal to a ton of carbon. In Accounting for Atmosphere I argue that carbon is a metric of the human, but here the relation is reversed – ‘is this carbon anthropogenic?’ And likewise the problem of duplication emerges again and again, to wit, does carbon information constitute a ‘second life‘ (Boellstorff) for carbon, the virtual repetition of a geological relation? I’ve been saying for a long time now that the institutions do not yet exist for properly contending with climate change as a political problem. All of that seems to be resoundingly confirmed by the further dissolution of the UNFCCC climate talks, all the more so from the Bonn meetings this week, which Hedegaard has accused some countries of backing off the already very weak Durban agreement. This paper discusses three figures of climate anticipation in order to show that climate change poses the problem of anthropology per se, that is, the planet with respect to anthropos. The full paper can be accessed via the link above (about 8000 words). A remarkable turn of events for climate scientists in the past several years has been momentous ecological changes that have accompanied current rises in average earth temperatures. What was before experienced as predictions about polar and glacial ice loss, ecological shifts and intensified weather is now increasingly confirmed. Moreover, the real-time changes in many cases are outpacing the predictions. This paper is an effort to think through the connection between ecological harm and recorded increases in average earth temperatures, the latter being a statistical touchstone for validating climate models which generally try to anticipate general climatological changes. It has been increasingly understood ‘Earth system’ (Crutzen 2006; also 2002a) is already undergoing profound changes, but the extent of these changes has barely been hinted at, and even less clear are the implications for specific ecosystems or indeed for human settlements. Reciprocally, this may be viewed as a problem of ‘man’ in a specifically neo-modern sense; Crutzen’s theory of the Anthropocene (Crutzen 2002a, 2002b; Zalasiewicz et al 2008) as a geological epoch succeeding the Holocene places distinct biophysical and chemical markers on Homo sapiens’ collective ability to transform biospheric conditions. The language here is that of Earth in a ‘non-analogue’ condition, with implications for Earth as home. One is left with the original theoretical reflection on the possibility of climate change, long before it was understood as more than a problem of thermodynamics: Joseph Fourier in 1824 raised as a theoretical curiosity the basic question posed by a planet floating in space some 33deg. C warmer than an ideal blackbody of the same size and distance from the Sun (Weart 2003; Fourier 1827 ). One can pose the problem from a different direction as well, to ask what the significance might be of a society and a mode of reason which is predicated on the geological extraction of billions of tons of fossil energy, stored hundreds of millions of years ago, then converted again via thermodynamic processes into a historically novel form of society (Mirowski 1989; Smil 2005). If the former figure relates to the arbitrariness of a planet floating in space then the latter provides a materialist engagement with practical activity within the human oikos (Arendt 1998). Either case, we might say now, hinges on the apprehension of open futures. With respect to climate knowledges I discuss in this paper, the question is, are there measurable events that might allow us to understand the changes in store for a climate transformation? Unlike modeling exercises, measurable changes underfoot create a new need to link the virtual to the actual and back again. The scope of this essay must be tightly constrained for two main reasons. The first pertains to climate sciences themselves, which have long been unfairly accused of exaggerated claims about impending ecological collapse (e.g. Swyngedouw 2010, Romm 2012b). As a response to this, as many have noted, many public climate pronouncements including the aggregative scientific review work of the Intergovernmental Panel on Climate Change, have adopted conservative scientific assumptions for making politically relevant statements about scientific results. The result has been an extremely articulate awareness of uncertainties of climate science combined with a certain amount of obsessiveness or care in the public communication of science (and reflection on that public communication, e.g. Romm 2012a). The second constraint stems from the broad public interpretability of scientific results, which range from dismissiveness due to (incorrectly) presumed scientific uncertainty, to unnecessarily extreme assessments of impending doom by publics not used to thinking carefully about how climatic processes may or may not play out. There is a lot we don’t know, which allows for a broad range of imaginative potential. For some, uncertainty means inaction is a legitimate response; for others, it allows imagination to run unchecked. I focus here on three figures of anticipation that specifically constrain reasoned (imaginative) expectations about ecological futures with measured ecological changes discernible in the present. As I describe below, the climate bellwether, the fingerprint and the model event each imply a specific sort of ethical or political relation forged between data and event. The first relates to understanding that measured changes are in fact climate change, that is, where specific changes bear a ‘fingerprint’ that indicates we are observing climate change and not something else. It is a figure that allows for calibration of the models. The second pertains to advance warning afforded by ecological processes, what some are calling climate bellwethers, that may be taken as signals of how climate events may play out, for example, geopolitically. The last I describe are ‘model events’ for the economic implications of climate change such as storm events that reveal the inadequacy of existing infrastructure for managing extreme weather. Fig 1. 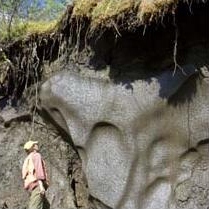 Ancient permafrost dated to 740,000 years bp, discovered during a gold mining operation in Canada. © (c) CanWest MediaWorks Publications Inc.
Frederic Keck’s (2011) convincing utilization of the nonhuman sentinel relation as a figure for costly inter-species communication in times of uncertainty bears mention here. Increasingly the terminology of the climate bellwether or climate sentinel has gained relevance for a widespread outbreak of avian influenza, H5N1. For Keck the question of signaling refers to the species’ own communication of threat, but it also bears on the epistemological status of the threat, since what remains unknown is the given point and time, and precise nature, at which an anticipated virus may appear. The signal to act is made within a historical context defined by the intensity of industrial animal farms and the velocity of global circulation. The potentiality of the moment is generative. Keck’s argument implies specific theorization of ornithological signaling within an evolutionary context. Because of the nature of the climate threat, usually ‘forward indicators’ do not pertain to individual species, since climate necessarily refers to a shift in pattern, rather than the emergence of some specific ontological threat (see Canguilhem 1989 on ontological theories of disease). I use the term bellwether rather than sentinel to preserve the distinctiveness of the climate threat and to hold in abeyance Keck’s assertion of the primacy of communication for his own theoretical resolution of the multiple contradictions raised by H5N1. For Keck the ethical ability to listen to sentinels involves awareness of the signaling being and hence interspecies communication (following Haraway 2008). I wonder if this interspecies ethics can be extended to ecosystems without being lost in a labyrinth of inadequate analogy. What happens when the activity of signaling is extended to ecosystems or to nonliving formations like glaciers? In particular, what ethics does it propose, that is, what are the beings here capable of being recognized? Meanwhile, the reciprocal configuration of now planetary contradictions force recognition of fossil energy commitments made long before any reasoned choice about outcomes could be determined. Keck’s figure of costly communication hinges on the communicative arbitrariness of prestige, one of Malinowski’s (1987) three primitive economies. But another figure of costly communication emerges from the necessity and impossibility of decision in which a concrete historical situation makes the assumption of risk compulsory.